Camilla is a new project manager at a well-known Danish film production company. She recently graduated from university with a degree in film and media studies and is tackling her professional life head-on. At the same time, she knows it is important to balance work and free-time. She is also very handy – when something breaks at home, she rolls up her sleeves and has a go at fixing it herself before calling a repairman. She prides herself in finding her own solutions with the help of YouTube videos and online user manuals. Recently she had to put on her thinking cap when her smart refrigerator began making noises. Ever the resourceful young woman, Camilla opened her HomeWhiz smart home app to find out what the issue might be and see if she could fix the problem herself. Using the app’s visual guide and step-by-step directions, it took Camilla just a few minutes to determine that her smart refrigerator had only a small problem and no repairman was needed. The easy-to-understand instructions showed her exactly how to adjust the stands to balance her fridge. And just like that, she had once again saved time and money! No need to read long user manuals any more. 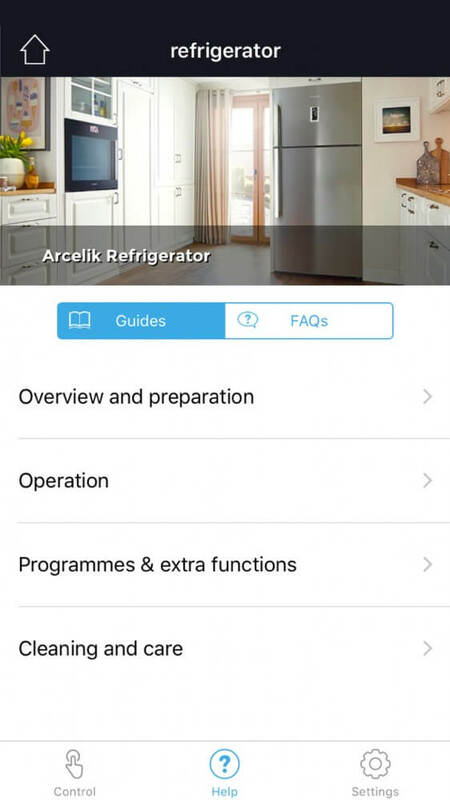 The HomeWhiz app offers easy to understand guides of the most important functions of your smart appliances. Camilla recently moved into a small flat in the centre of Copenhagen with her long-time boyfriend. At the moment, she is busy making her home as comfy as possible – “hygge” is the name of the game. She spends time scouring the city for lamps, rugs and furniture. She loves clean, modern Danish design and enjoys experimenting with colour. When it comes to appliances and gadgets, she prefers energy-saving and intuitive smart devices and her HomeWhiz smart home app. They automate much of her life and are easy to use with step-by-step user manuals on the app. This frees up time for Camilla to take care of other important things – or binge watch her favourite TV shows (in the name of work of course, because films are her greatest passion). She and her boyfriend saved up to buy an impressive home cinema system and integrated it into their smart home. Camilla and her boyfriend value the time they spend together with their friends. They often invite friends over for dinner so they can try recipes she has found using the HomeWhiz smart home app. Camilla is into sports and like many Danes spends a lot of time on her bike. When she travels, she enjoys wandering through big cities – she loves experiencing new things. It is important for her to make time for such excursions – another reason she loves her time-saving smart devices at home. Camilla was born in Jutland but prefers life in the city. She studied in Denmark’s capital Copenhagen where she also met her boyfriend. They have recently moved in together and are enjoying this new chapter in their lives. They are eager to make their household as convenient, time-saving and energy-saving as possible with their smart home system, devices, and apps. Their friends and visitors are always amazed at how user-friendly and intuitive their connected home is. Welcome to the home of the future! A young Londoner uses his HomeWhiz smart home app to operate his smart washer and dryer.